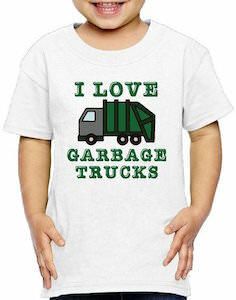 If you child like big garbage trucks then why not make them happy with this t-shirt that says “I Love Garbage Trucks” on it. The white t-shirt is just cute as it has a big truck on it and and it is green and grey and the text around it is green and says “I Love Garbage Trucks”. Now you child can admire garbage collection even more while wearing this fun t-shirt. 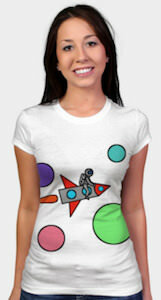 The t-shirt is made from 100% cotton and available in many sizes from 2T – 6. Now there is a t-shirt for little kids that love Miffy. 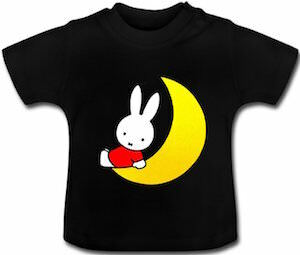 The t-shirt comes in black or white and on it you can find Miffy while she is sitting on the moon. The cute little bunny is loved by young and old and now the t-shirt can be worn by your little one. This Miffy t-shirt comes in sizes ranging from 6 months to size 5. A t-shirt with a cute rabbit like this will be loved by kids even if they never heard of Miffy but after they do get the shirt you may want to looking to the stories of this cute little bunny. This Christmas t-shirt shows an elf ready to party. The t-shirt shows a nice present with hanging on it an elf and besides that it also says “Have A hot Christmas”. Just wish everyone a hot Christmas by simply wearing this fun t-shirt. You can get this Christmas t-shirt in styles for men, women and kids and it comes in many colors and sizes to. Any day of the year is a good day to think about Christmas and that makes this t-shirt also perfect for any day of the year. Get ready to support the elf with this Hot Christmas t-shirt. If you want an amazing shark t-shirt then this shirt should be one to look at. 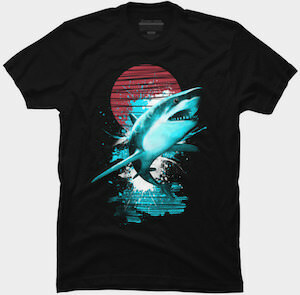 On this dark t-shirt (available in a bunch of dark colors) you can see a shark jumping from the water while there is a red moon in the sky. It all looks amazing and it would be a great t-shirt to wear for Shark Week. You can get this shark t-shirt in styles for men, women and kids and in sizes accordingly. No a goldfish t-shirt won’t do so maybe this shark t-shirt could be perfect for you. 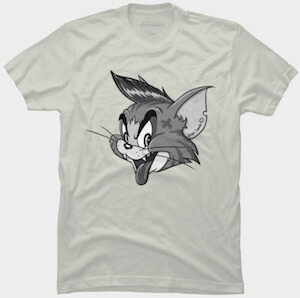 Almost everyone know Tom And Jerry and this t-shirt shows Tom the cat. 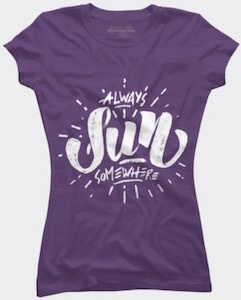 You can get this t-shirt of Tom in styles for men, women and kids and it does come in many colors to. On the t-shirt you can find a black and white portrait of Tom the cat and he seems to be a bit rough, but I guess that happens if a mouse like Jerry keeps fooling your around all day for so many years. It of course is still fun wearing a t-shirt with a cat like this as it does show that you support your cartoon friend when needed. 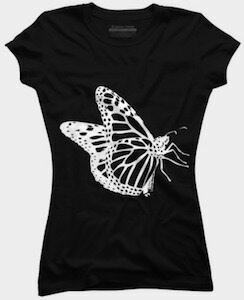 This butterfly t-shirt is available in styles for men, women and kids and of course in sizes they fit best. On the t-shirt you can find a big butterfly but you only can see an outline in white and that really makes you see the amazing details of this animal. You can get this 100% cotton butterfly t-shirt in many colors so that you can show this amazing animals on a t-shirt that looks best on you. Now it is just time to select the style, size and color and then you can show the world how much you like butterflies. This hedgehog t-shirt shows a hedgehog that loves to garden and you can get this cute t-shirt in styles for men, women and kids. 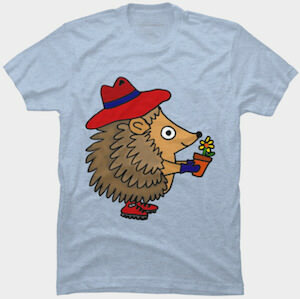 On this t-shirt you can see a hedgehog and it’s wearing sturdy shoes a hat and gloves and it’s also holding up a flower in a pot. Yes this hedgehog loves to garden and smell the flowers. 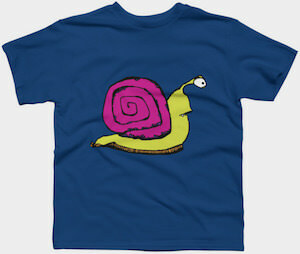 It’s just an adorable t-shirt that is available in many sizes for the whole family and it also comes in many fun colors and all are made from 100% cotton.